Achieving maximum physical, emotional and spiritual health through relaxation breathing, movement, visualization/positive imagery and meditation. Moving Meditation®:Fitness : A Fitness and Relaxation Program greatly impacts achievement of one's personal and professional objectives. This program is available on audio CD. 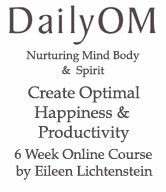 The Moving Meditation® Program was founded by Eileen Lichtenstein, MS.Ed.,CPT., in 1995. She has helped thousands of people achieve maximum health through a program design to help adults and children, including the physically and emotionally challenged populations. Side A: Active section includes warm-up stretches and instruction in relaxation breathing. Original fluid upper body movements are then added along with visualizations and positive imagery. This program can be used with walking, running, skating, exercise bike, aquacise and seated exercise. It can also be used as a warm-up/cool down for a power walking or running program. Side B: Relaxation section includes progressive muscle relaxation, gentle stretches, and equipped meditative sequences. The Writer's Dream: A Show by Writer's for Writers. After paypal process you will be directed to the mp3 download for either the full CD or individual tracks.